Northern upstarts Check On have sold out everything they've done to date (by my reckoning) and are following up their Hen Parties with two (maybe more?) 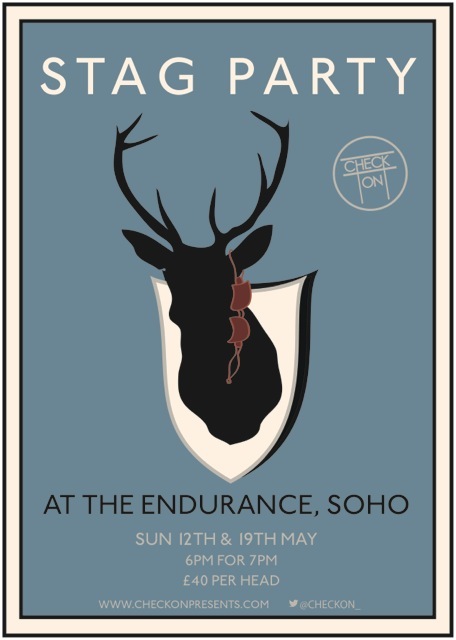 Stag Party dinners at The Endurance in Soho. These take place on Sunday evenings. Expect Venison! Venison liver pate coated in cherry jelly served with toasted rye bread. Potato & spring onion cake with a slice of rare venison & quails egg. With a nutty white russian mini hard shake. Pear poached in spiced red wine served with lemon thyme scented mascarpone cream." That all sounds amazing! Guess they're doing their bit for this country's apparent deer infestation!